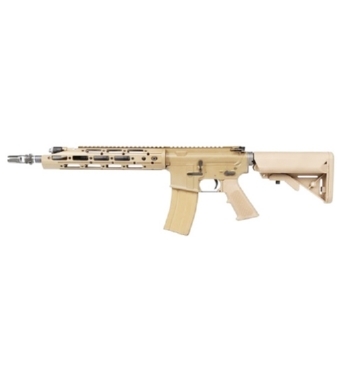 PRODOTTO DALLA WE, FUCILE ELETTRICO MODELLO KATANA RIS RAPTOR CQB FULL METAL, COLORE TAN. UTILIZZA BATTERIE CQB CHE VANNO RIPOSTE NEL CALCIO (NON COMPRESE), CARICA BATTERIA NON COMPRESO. GUSCIO IN ALLUMINIO, 4 SLITTE PER IL FISSAGGIO DI ACCESSORI, CALCIO CRANE, MANIGLIONE PER IL TRASPORTO RIMOVIBILE. VISTA LA COMPATIBILITÀ DELLA PARTE INFERIORE CON I PEZZI MARUI, È POSSIBILE IL MONTAGGIO DI MOTORI, INGRANAGGI, BOCCOLE ED ALTRO. CON L'INNOVATIVO SISTEMA KATANA DAL CILINDRO SEPARATO IL FUCILE È IDEALE PER LE SOSTITUZIONI RAPIDE DURANTE IL GIOCO.